An eCOA solution is used in clinical trials for the collection of patient data. The global electronic clinical outcome assessment (eCOA) solutions market is expected to have a sustained demand growth during the forecast period. The major factors driving their market expansion include increased regulatory compliance across industrial researchers, growing public-private investments for clinical researches, rising need for improved data standardization and collection aimed at early regulatory approval, and expansion of end user base across major countries. 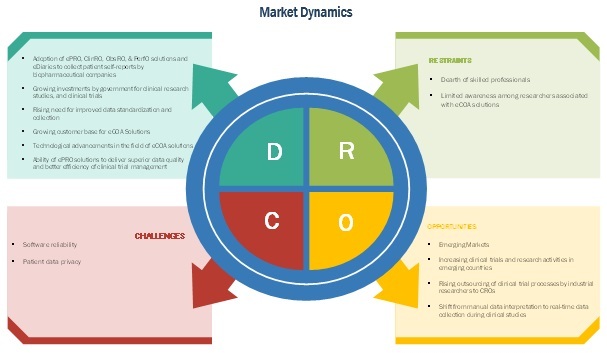 Moreover, growing number of clinical research across emerging countries coupled with increased research outsourcing by pharma giants and industry shift from manual data interpretation to real-time data analysis are expected to offer significant growth opportunities for global players during the study period. However, significant implementation costs and dearth of well-skilled professionals from accurate data interpretation are poised to restrain their optimal demand growth during the forecast period. As of 2018, Aris Global, Bioclinica, CRF Bracket Company, eClinical Solutions, ERT Clinical, Kayentis Medidata Solution, Inc Merge Healthcare Solution, Inc., Omincomm Systems, Inc., Oracle Corporation, Paraxel International Corporation, YPrime, Inc., and Clinical Ink among others are some of the key players present in global electronic clinical outcome assessment (eCOA) solutions market. During 2015-2018, these companies adopted new product launches and enhancements, collaborations, agreements, partnerships, and geographical expansions as their key business strategies to ensure their growth in this market. *Segmentation By Product, Approach, and End User Chapter May Change Slightly Based on Primary Insights Gathered During the Course of Actual Market Study. **Row Would Include Consolidated Market Numbers of Latin America, Middle East, and Africa. ***The Top 13 Companies in the Global eCOA Market Will Be Profiled. Top Companies Will Be Decided Based on Primary Insights Gathered During the Course of Actual Market Study. ****Details on Overview, Product Portfolio, and Market-Specific Developments Might Not Be Captured in Case of Unlisted/Privately-Held Companies.